I would love to tell you that this was the first story of a family member getting shamed for moving a parent into a senior care community, but it is not. As the director of Memory Care at an assisted living community, I’ve been working in dementia care for five years. Unfortunately, I hear this kind of thing all the time. But what should you do when your family disagrees about care for your senior parent? We’ve all heard of “shaming,” a phrase that seems to have picked up more popularity recently. We have seen everything from “body shaming” to “middle-class shaming” in articles online. I’ve become very familiar with another type of shaming: shaming people for moving their loved ones into long-term care communities. Although it would be very nice if everyone could take care of their aging loved ones at home forever, this is just not the case for many families. There are many factors involved: where the family lives, what jobs and responsibilities the family members have, what type of care the aging adult needs, financial concerns, nutrition, and health concerns. The most complicated are mental health concerns for the aging adult. Taking care of anyone at home is challenging. Taking care of a senior with dementia at home is particularly difficult. For example, if you are caring for someone with dementia in your three-story house, you cannot explain to that person that he or she should not attempt to use the stairs if they are home alone. People with dementia have trouble remembering facts, following directions, or understanding risks. These cousins hadn’t retired early, just so they could help care for this aging woman in her own home. They weren’t taking time away from friends, other family, and vacations to bathe, clothe, and feed this woman. Sometimes people think that caring for a senior loved one is just like caring for your own children—but that’s just not the case. When you are raising children at home, there’s a community that rallies around you. You host big birthday parties, invite other parents and their children over to your house, plan nights out, call up babysitters, and, although you are probably exhausted, you feel joy in watching your children learn and grow. From what I have seen, caring for an aging parent is the complete opposite. It feels as if there is no sense of community. There is no joy in watching them grow and learn. There is only guilt, sadness, and panic as you watch them descend deeper into physical and mental disability. There aren’t birthday parties, family gatherings, or babysitters to lend you a hand. In fact, some family caregivers are in danger of developing Caregiver Stress Syndrome. I offer a phone call service for caregivers who have questions about dementia care. 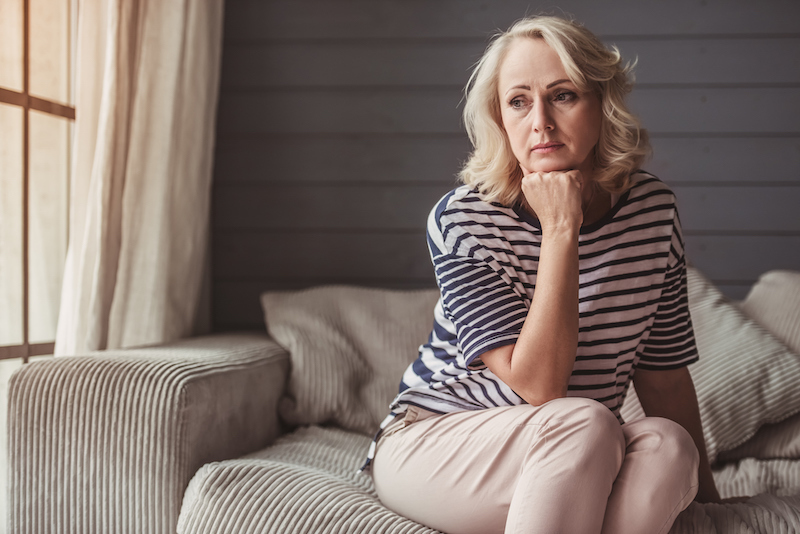 While I always help these caregivers troubleshoot their dementia-related issues and provide advice about senior care communities or at-home senior care, we always end up talking about guilt. All of these caregivers feel guilty, even the ones who are taking care of their loved ones at home. Choosing to move a senior loved one into a care community is a personal decision, and you should tour the community and ask questions to make sure you are informed. Communities are not the awful places we read about decades ago. “Putting someone in a home” does not carry the painful weight it used to carry. Many of the care communities I’ve visited are clean, state-of-the-art buildings that offer social activities and outings. Sure, senior care communities are not always perfect, but caring for people is an imperfect science. Choosing to move a loved one into assisted living or skilled nursing should not be a worst-case scenario. Sometimes it’s the best-case scenario for aging adults and their families. While you are caring for your aging parent, you will need support. Here at Bethesda, we strive to provide exceptional care for seniors and their families. With a wide range of resources for family caregivers, including Respite Care and our unique Care Management program, we provide the right level of support and care, at the right time. Take a tour of our many Assisted Living and Skilled Nursing communities across the St. Louis area, or give us a call to learn more about our services for family caregivers. Continue reading for more Caregiver Tips from Bethesda. By Rachael Wonderlin for Next Avenue.